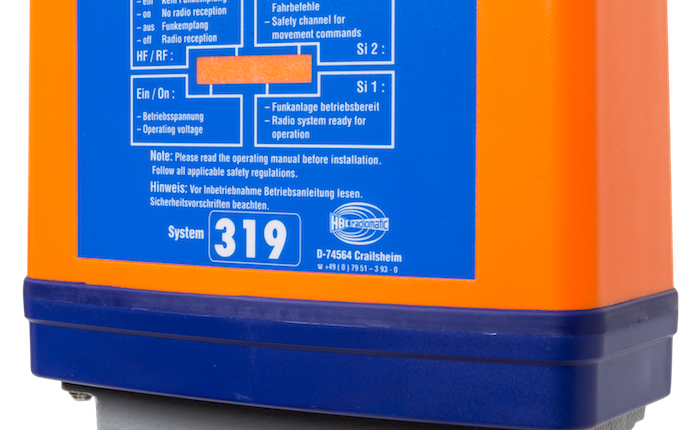 Crailsheim, Germany-based radio remote control manufacturer HBC-radiomatic GmbH has unveiled its new FSE 319 plug-and-play receiver, suited to tough, mobile industrial applications. Weighing 680g and measuring 152mm (5.98 in.) x 140mm (5.51 in.) x 66mm (2.6 in. ), the FSE 319 is a compact device for applications with up to 18 on / off control functions and DC power supply. With a Harting Han® or ILME connector, it can be plugged directly into the machine controls without any additional wiring, thus, saving installation time and money. The FSE 319 scores big by various valuable features, including an integrated flashlight and horn and HBC’s advanced automatic frequency management via adaptive frequency hopping, as standard. The new receiver is equipped with an E-STOP function, offering PL d category 3 according to EN ISO 13849-1:2015. LEDs that indicate operating status, integrated signal light for indication of radio operation, and a wide temperature range of -25 °C to +70 °C, are other notable additions. Suggested combinations with the FSE 319 are three particular HBC transmitters (control units) including the micron 5, which is widely used in crane applications. It is also suitable for use with the keynote, a versatile system for diverse, one-step applications; and the eco, a bellybox-style remote control with joysticks that is common in construction, industrial, and mobile hydraulic operations. Depending on the customer’s demands, the new receiver is compatible with other products in HBC-radiomatic’s extensive range.